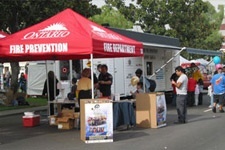 The Ontario Fire Department's Fire Prevention Bureau has a proud and rich history of providing the City of Ontario with a fire and life safety prevention service second to none. Started in June 1948 under Ordinance 810, the Bureau has provided a sustained hazardous mitigation program from the beginning. Throughout the years, the fire ordinances and codes have been replaced to adequately address the hazards of the times. Through comprehensive planning, a community fire defenses program is in place. This plan uses the latest data and technology to develop a community fingerprint. The Prevention Bureau uses this program as its vehicle for service delivery. The Fire Prevention Bureau is operated in a business-like manner, providing responsive customer-friendly service. The Bureau utilizes various databases in conjunction with other city departments to identify the most hazardous occupancies in the City. Periodic inspections are then conducted to ensure code compliance. Site & Building Inspections – The Bureau conducts life safety inspections at new and existing occupancies, on a scheduled basis for permit requests, annual permit renewals for various activities, and upon request. Business License Fire Inspections – Reviews and evaluates each business license application in the City for compliance with fire and life-safety issues and coordinates with other regulatory agencies when joint reviews are necessary. Enforcing Fire Code – Helping businesses and building owners understand the inspection program and ensure fire and life-safety code compliance, thus helping individuals understand how they contribute to the overall public safety. New Development – Bureau personnel sit on the Development Advisory Board to review new businesses coming into the City for conformance to fire and life-safety issues, giving our customers early and consistent advise about their project. Plan Review Process - Plans are reviewed for compliance with applicable codes, ordinances and standards, in a timely manner. Special Events – All special events and activities are reviewed by the Bureau in order to ensure public safety within the City of Ontario. This is achieved through inspections and evaluations of all special event applications with potential fire and other life-safety issues. Public Education and Community Relations – A variety of public education safety programs for all age groups are offered including a safety house program, a juvenile fire setter intervention program, home evacuation planning for the elderly, disabled or seriously ill, and school/preschool fire safety education programs. Code Development - Fire and life safety code requirements are incorporated into all new development and construction. The Uniform Fire Code is adopted by the City for the purpose of prescribing regulations governing conditions hazardous to life and property from fire, hazardous materials or explosions. Staff ensures compliance with state mandates and amends the codes based upon certain local conditions. Ontario’s codes continue to address the latest technological advances. Every three years, the California Health and Safety Code mandates that all public agencies responsible for administering building and safety and fire codes comply with the state adopted codes. Fire Investigation – The fire investigators are responsible for investigating fires to determine origin and cause. As commissioned peace officers, fire investigators conduct criminal investigations and assist in the prosecution of arsonists. The investigators also assist with the department’s juvenile counseling program. Fire inspectors provide a comprehensive fire investigation service to the City of Ontario by investigating all fires to their conclusion. Data gained from the investigations unit is used to help shape the code adoption, public education, criminal prosecution and is aimed at enhancing the overall service delivery. Filming – The City of Ontario has a staff of certified fire safety officers (FSO) that ensures all filming in the City is done safely. The Bureau is supported in its efforts to deliver service by the eight engine companies and two truck companies that conduct fire inspections. A self-inspection program is also utilized. As a community that has its own mall, convention center, airport and a recently annexed area called the "New Model Colony," we are poised to face the challenges that lay before us because we don’t forget the lessons that we have learned from our past. For more information about life-safety and fire related development issues call (909) 395-2029.